CY seat (W:47xD:49 cm). Comfortable, padded seat with a rounded front. The user enjoys good, supportive sitting comfort, and the seat design also ensures good blood flow to the legs. ALB backrest large (W:39xH51 cm) The Active Lumbar Backrest (ALB) is a unique, two-part, ergonomically-shaped backrest. It consists of lumbar support and a backrest that is adjusted individually for optimum support of the lumbar region and spine. The large ALB backrest is high, with a flat shape, and provides support for the whole back. ALB backrest medium (W:39xH49 cm) The Active Lumbar Backrest (ALB) is a unique, two-part, ergonomically-shaped backrest. It consists of lumbar support and a backrest that is adjusted individually for optimum support of the lower back and spine. The medium ALB backrest is high, with a round edge at the top, and provides more support for the upper back, and the possibility of free movement in the back, shoulders and arms during various activities. ALB backrest small (W:39xH39 cm) The Active Lumbar Backrest (ALB) is a unique, two-part, ergonomically-shaped backrest. It consists of lumbar support and a backrest that is adjusted individually for optimum support of the lumbar region and spine. The small ALB backrest provides support for the lumbar back. 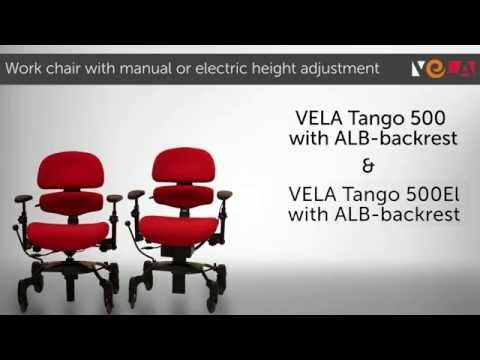 VELA Seating in one sense is Occupational Therapy on wheels. The seats can be configured in endless combinations to satisfy every requirement.